Hi everyone! Today is the third day of the My FavoriteThings July release countdown. This release is packed with amazing new products and it was so fun to play with all the new stuff! Most of the supplies I used for this project are linked at the bottom of this post. I die cut the Happy Birthday Circle Frame from white cardstock. I then decided to keep just one HAPPY BIRTHDAY around the frame, so I cut the other with scissor. I colored the letters with Copic markers in rainbow colors and left the circle white. I then created a fun background using the ink smooching technique with Distress inks (still the same video tutorial HERE). I fixed the circle on top of the card front using foam pads for more dimension. Next, I stamped the hippo from the newest BB Happy Hippos set in black ink, colored the image and cut it out with scissors. I adhered the hippo with foam squares too. To finish off my card, I added some enamel dots. I LOVE this sooo much! Darling!! The hippo is just too adorable hiding that little gift!! Love the shading and copic coloring!! 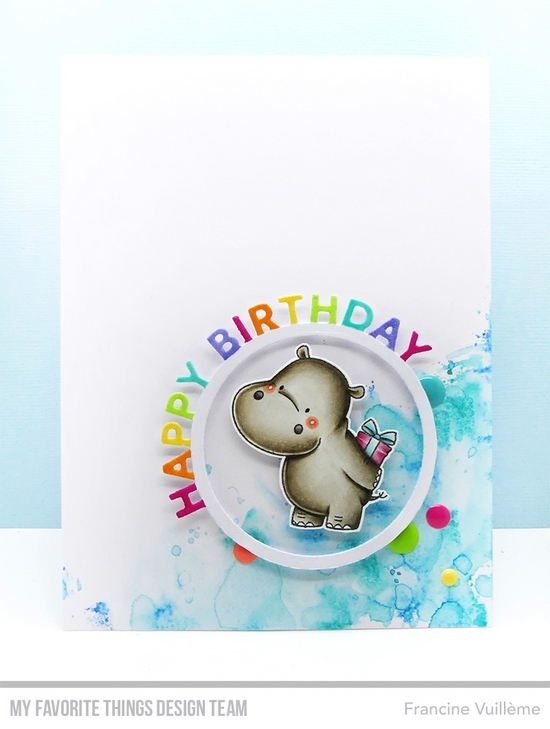 Simply terrific combination of the sweet hippo and a rainbow circle Happy Birthday! You make the most fun cards, Francine - always a treat for the eyes. Love this cutie! What a fabulous ink smooching technique you used on the corner of this lovely card - it looks like marble! I really enjoyed watching the video tutorial on it as well - thanks so much! Great Release! CUTE card! I especially love that you changed up the circle Happy Birthday die by keeping only one sentiment! So cute, Francine! Your watercoloring really makes this hippo pop and I love how you colored the alphas! This is freakin' Ahhh mazing. I love this card and it made me smile from cheek to cheek. Francine, this card is so cute. Like how you adapted the birthday circle and used it to frame your hippo. Thanks for sharing your design. Love the hippo, he makes me smile. Adorable card.